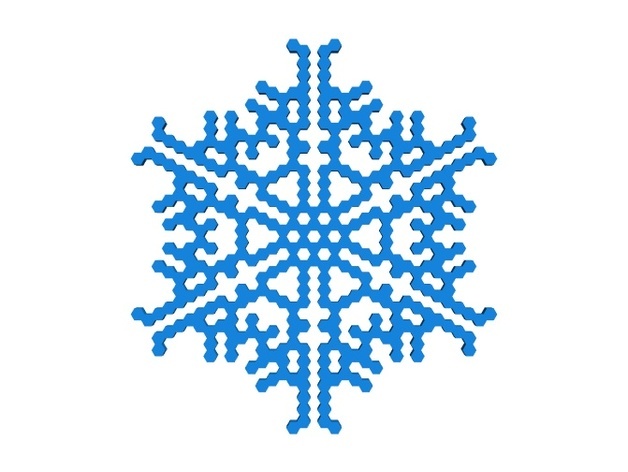 The previous post's quick cellular automaton approach to snowflakes was a bit crude. For more realism (but still with a lot of oversimplification), I wrote code for the Reiter snowflake growth model. This is a "real-valued" cellular automaton (or a finite-differences evolution). 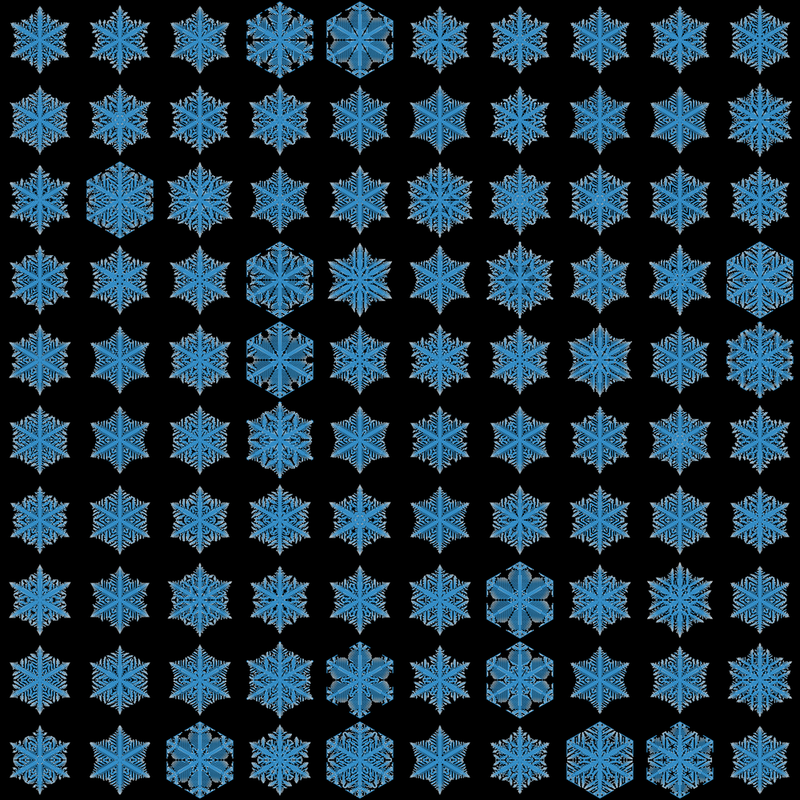 I made a simple cellular automaton snowflake generator in OpenSCAD. By default it uses Stephen Wolfram's rule that a hex cell stays alive once alive and a cell is generated if it has exactly one neighbor. 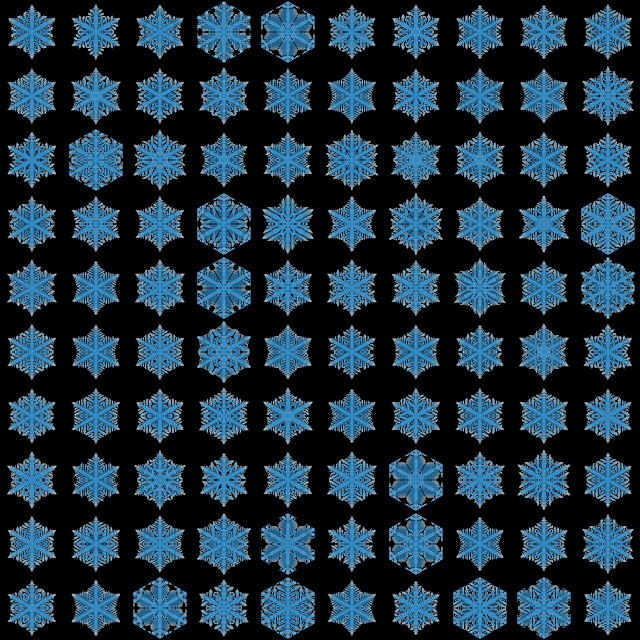 Adding a tiny bit of indeterminism--a chance of 0.5 of generating a cell instead of certainty--makes things look more like a real snowflake, though. Tap on Customizer in the above link if you want to play with it. And here it is on our Christmas tree. Merry Christmas! A difficult metaphysical question is what makes something be a property rather than a particular. In general, heavy-weight Platonism answers the question of what makes x be F, when being F is fundamental, as follows: x instantiates the property of Fness. It is hard to see what could be more fundamental on Platonism than being a property. So, a heavy-weight Platonist has an elegant answer as to what makes something be a property: it instantiates the second-order property of propertyhood. A standard thing in the philosophy of science to say such stochastic explanation questions is that one can given an answer in terms of the objective chance of the event, even when these chances are less than 1/2. But consider the question: Why did this atom decay exactly at t1? Here, the objective chance may well be zero. And surely that an event had zero chance of happening does nothing to explain the event. After all, that the decay at t1 had zero chance does not distinguish the atom’s decaying at t1 from the atom’s turning into a square circle at t1. And to explain something we minimally need to say something that distinguishes it from an impossibility. Here, I think, the causal powers theorist can say something (even though I may just want to reject the presuppositions; see the Response to Objection 2, below). Stochastic systems have a plurality of causal powers for incompatible outcomes. The electron in a mixed-spin state may have both a causal power to have its spin measured as up and to have its spin measured as done. Normally, some of the causal powers are apt to prevail more than others, and hence have a greater chance than others. But even the weaker causal powers are there, and we can explain the event by citing them. The electron’s spin was measured as, say, up because it had a causal power to that outcome; had it been measured as, say, down, that would have been because it had a causal power to that outcome. We can give further detail here: we can say that one of these causal powers is stronger than the other. And the stronger causal power has, because it is stronger, a higher chance of prevailing. But even the weaker causal power can prevail, and when it does, we can explain the outcome in terms of it. This story works just fine even when the chances are zero. The weaker causal power could be so weak that the chance associated with it has to be quantified as zero. But we can still explain the activation of the weaker causal power. So, going back to the decay, we can say that the atom had a causal power to decay at t1, and that’s why it decayed at t1. That causal power was of minimal strength, and so the chance of the decay has to be quantified as zero. But we still have an explanation. The causal powers story about the atom encodes information that the chances do not. The chances do not distinguish the atom’s turning into a square circle from the atom’s decaying exactly at t1. The causal powers do, since it has a power to decay but no power to turn into a square circle. Objection 1: Let’s say that the atom has twice as high a chance of decaying over the interval of times [0, 2] as over the interval of times [0, 1]. How do we explain that in terms of causal powers, given that there are equally many (i.e., continuum many) causal powers to decay at precise times in [0, 2] as there are causal powers to decay at precise times in [0, 1]? Response: It could be that just as the causal power story carries information the chance story does not, the chance story could carry information the causal power story does not, and both stories reflect aspects of reality. Another story could be that there are causal powers associated with intervals as well as points of times, and the causal power to decay at a time [0, 2] is twice as strong as the causal power to decay at a time in [0, 1]. There are difficulties here, however, with thinking about the fundamentality relations between the powers associated with different intervals. I fear that there is no avoiding an infinite sequence of causal powers that violates causal finitism, and I am inclined to reject the possibility of exact decay times—and hence reject the explanatory question I started this post with. I don’t see much hope for a measurement of an exact time after all. But someone with other commitments about finitism could have a story. Objection 2: This is just like a dormitive power explanation of opium making someone sleepy. Response: Opium’s dormitive power is fundamental or not. If opium has a fundamental dormitive power, then the dormitive power explanation is perfectly fine. That’s just the kind of explanation we have to have at the fundamental level. If the dormitive power explanation is not fundamental, then the explanation is correct but not as informative as an explanation in terms of more fundamental things would be. Likewise, the power to decay at t1 either is or is not fundamental. If it is fundamental, then the explanation in terms of the power is perfectly fine. If it is not, then there is a more fundamental explanation. But probably the more fundamental explanation will also involve minimal strength powers with zero activation chances, too. The right exercise of our wills is precisely that which fullfills the proper functions of the will. A. To fulfill the proper function of the will is good for us, and it’s right to pursue what’s good for us. B. It is directly true that the right is what fulfills the will’s proper function. Exercising the proper function of the will, like exercising any other natural faculty, of course good for us, but that isn’t what makes it right. Story A makes the theory a form of eudaimonism, since it implies that what is good for us is generally to be pursued. In other words, Story B has much less in the way of normative ethics implications: it is very strictly a story about the meta-level. There is reason to prefer Story A: it leads to a helpful normative ethics by itself. There is reason to prefer Story B: the normative ethics that Story A leads to is a form of rational egoism. I like Story B. But Story B must be supplemented with an account of what fulfills the will. The answer to that is love. Necessarily, any morally perfect being can morally perfectly deal with any possible situation. Necessarily, one can only morally deal with a situation one would exist in. So, necessarily, any morally perfect being is a necessary being. Necessarily, any morally perfect being can morally perfectly deal with any possible situation in which it exists. But that’s actually a bit weaker than we want. Imagine a being that can deal with one situation and only with it: the case where it has promised to eat a delicious cookie that is being offered to it. But imagine, too, that the being can only exist in that one situation. Then (4) is satisfied, but surely being able to fulfill a promise to eat a cookie isn’t enough for moral perfection. So we do actually want to strengthen (4). Maybe there is something in between (1) and (4) that works. Maybe there isn’t. A maximally powerful being can weakly actualize any possibility. An epistemically perfect being can know any possible proposition. A rationally perfect being can rationally deal with any possible situation. It is looking like moral perfection, maximal power, epistemic perfection and rational perfection each individually imply necessary existence. Possibly, there is a morally perfect or a maximally powerful or an epistemically perfect or a rationally perfect being. So, there is a necessary being. I am not saying that this a super-convincing argument. But it does provide some evidence for its conclusion. At a recent pro-life event that I participated in, the question was asked the panel how to convince a pastor that one’s church should support the pro-life cause, notwithstanding pro-choice congregation members. An answer was offered by a panelist that talked well of standard texts of Scripture that have bearing on the humanity of the fetus. A day after the event, one of the audience members told me that there was too much focus on the status of the fetus, because even if students are convinced that human life starts at conception, they still think that because of conflict between the rights of the fetus and the rights of the mother, abortion is permissible. Then he will say to those at his left hand, ‘Depart from me, you cursed, into the eternal fire prepared for the devil and his angels; for I was hungry and you gave me no food, I was thirsty and you gave me no drink, I was a stranger and you did not welcome me, naked and you did not clothe me, sick and in prison and you did not visit me.’ Then they also will answer, ‘Lord, when did we see thee hungry or thirsty or a stranger or naked or sick or in prison, and did not minister to thee?’ Then he will answer them, ‘Truly, I say to you, as you did it not to one of the least of these, you did it not to me.’ And they will go away into eternal punishment, but the righteous into eternal life. (Matthew 25:41-46). These texts make it clear that we have highly onerous duties towards others, duties we may have done nothing to acquire. It is very difficult to defend disconnection from the violinist while thinking about such texts. But of course if we use such texts then we had better be sure that we live so that they do not condemn us, too. For they are indeed terrifying texts on many fronts. May God have mercy on all our souls! If performing an action constitutes you as a bad person, the action is morally wrong. Virtue ethicists, of course, make this a biconditional that defines wrongness, but I would have assumed that just about everybody would agree that the conditional (1) is true. If the violinist is your own minor child, disconnecting from the violinist makes you a bad parent and a bad person. But one cannot consistently accept (1) and (2) and think it is morally permissible to disconnect from the violinist when the violinist is one’s own child. I would love to see empirical data on whether people who find the violinist case compelling deny (1) or deny (2). Thomson herself probably denies (2). In an earlier post, I argued that the definition of omniscience as knowing every truth and believing nothing but truths is insufficient for omniscience because an omniscient being would also be certain, and knowledge of every truth does not guarantee certainty of every truth. I’ve been thinking about Thomson’s Violinist case. I should say about that case that it seems utterly obvious to me that in the case where the violinist is your child and you are in no long term danger from the connection, it’s a vicious failure of parental duties to disconnect. But my current interest is not so much in figuring out the case itself, as trying to figure out why so many people find it compelling. To that end, I’ve been thinking about two symmetric cases. Lifeboat: You, who are a really bad pianist, and a really bad violinist find yourselves drifting in a lifeboat in space, kidnapped and put there by the Music Lovers’ Society, to keep you both from performing publicly. The lifeboat is designed for one person, and the hyperspace engines don’t work with the mass of two people. Fortunately, your calculations show that in nine months the lifeboat drift will get you back to earth, and there is air, food and water enough for two for nine months. But it’s really uncomfortable. You both have to sit squished together on an uncomfortable chair, you’re away from your friends (though you can talk to them on hyperspace Skype whenever you like), from your job, etc. Waste disposal is handled hygienically but it’s a rather disgusting process under the circumstances. However, when the violinist is asleep, you could just push him out of the airlock, and then use the hyperspace engines to get back home in a day. Of course, the violinist could do the same to you. Frankenkidney: Both you, who are an excellent pianist, and an excellent violinist are suffering from kidney failure. The Music Lovers’ Society kidnapped both of you and out of two malfunctioning kidneys made a single functioning frankenkidney. When you awake, you are taped to the violinist, with your abdomens touching. You know that where the abdomens are touching you each have a hole, and in that hole is that frankenkidney. You could wait nine months because that’s how long it takes for the lab to culture brand new kidneys for you and the violinist. Or you could pull the frankenkidney from the violinist’s body, put it in yours, and then have some straightforward surgery to close up the hole. Of course, the violinist could do the same to you. Notice that in terms of the consequences of your decision, as well as desert and contract, these cases are very much like the original violinist story. Your personal space is encroached on by a violinist who is innocent of the encroachment. You can end the encroachment at the expense of the violinist’s life. Lifeboat Supplement: After a few hours in the lifeboat, the violinist’s body’s thermoregulation has shut down and the lifeboat’s heating system is working poorly. Your body heat is enough to maintain a liveable temperature for the two of you in the lifeboat, and medicine can fix his problem once you get back to civilization, but if the violinist threw you out the airlock, he’d soon die of hypothermia. You'd do fine physically without him, though. In the supplemented lifeboat story, there is a net flow of life-giving benefits from you to the violinist, just as in the original violinist case. But it would be absurd that as soon as the violinist’s body’s thermoregulation shuts down you can throw him out the airlock. Yet the resulting story is now very much like the original violinist story, I think. My conjecture is that a central reason the violinist case seems compelling to so many has to do with the asymmetry between the two parties, and when one primes the thinking by starting with a more symmetric situation, as in the Lifeboat case, the intuitions change, and perhaps stay changed even if one adds an asymmetric supplement. By the way, for another symmetric analogy, see Himma. It is always more perfect to be able to do more things. Being able to do impossible things is a way of being able to do more things. So, a perfect being can do impossible things. But I really don’t want to embrace 3. It is always more perfect to know more things. Knowing falsehoods is a way of knowing more things. So, a perfect being knows falsehoods. Once we realize that among “more things” there could be falsehoods, it becomes clear that 4 as it stands is false, but needs to be restricted to the truths. But arguably what truths are to knowledge, that possibles are to power (I think this may be a Jon Kvanvig point, actually). So we should restrict 1 to the possibles. There is a lot to be said for the Mill-Ramsey-Lewis (MRL) account of laws as the axioms of a system that optimizes a balance of informativeness and simplicity. But there are really serious problems. The deepest is that the MRL regularities seem to systematize but not explain. Similarly, there is a lot to be said for rule utilitarianism, but it also suffers from really serious problems. The deepest is probably that it just does not seem to be a compelling moral reason to do something harmful that under normal circumstances it is beneficial. The MRL account of laws and rule utilitarianism are similar and a number of the problems facing them are structurally similar. Most deeply, the MRL laws don’t move things physically and rule utilitarian rules don’t move us morally. But there are also structurally similar technical problems, such as the account of simplicity, the way in which simplicity is to be balanced with informativeness or beneficiality, the apparent influence of future facts on present laws or moral truths, etc. It is interesting that many of the problems of both accounts can be solved by bringing in theism. For instance, one can get a theistic MRL account of laws by saying that laws are the divinely willed axioms of a system that optimizes a divinely defined balance of informativeness and simplicity. And one can get a theistic rule utilitarian account by saying that laws are the divinely commanded rules that optimize a divinely defined balance of beneficiality and simplicity.